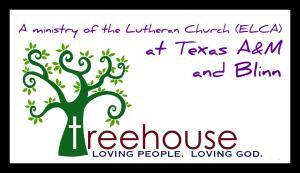 Welcome to Treehouse, the Lutheran Campus Ministry at Texas A&M and Blinn College. We are an open campus ministry, welcoming to students and young adults of any or no faith background. Below are the mission statement, core values, and statement of welcome that students have prioritized as central to understanding who God is calling Treehouse to be. We hope you find a home here! Mission: Loving people. Loving God. We celebrate the sacred worth of all people. We express God’s radical love through genuine welcome. We seek to be focused on the needs of our neighbors. We are sustained by the presence of Christ made known to us in our everyday lives. With open eyes, hearts, and minds, we embrace disagreement, doubt, and difference. We honor study and thinking as a means to deeper faith. We offer our compassion and presence to the world, using our voices to advocate for those in need. We celebrate laughter, refreshment, and friendship as good gifts of God. In all things, we seek to be intentional about our lives as followers of Jesus. Statement of Welcome: At Treehouse, we celebrate that each person is of sacred worth. We embrace all people, affirming the gifts of race, ethnicity, disability, sexual orientation, gender identity and expression, and faith. No matter where you are on your journey, you are welcome here.